Hundreds of edible wild mushrooms exist in North America, and many, like the beloved morel, are so easy to identify a mildy clever chimp can spot them with no trouble. The coccora is not one of those mushrooms. Welcome to the wild and woolly world of Amanita vernicoccora. Never heard of it? Not surprising, as it is also known as A. calyptrata, A. lanei and A. calyptroderma. It has a beautiful little cousin named Amanita velosa, too — although that one is in it’s own group, biologically speaking. The Italians call the entire group either coccora or coccoli, and they are one of the finest-eating mushrooms in the world. But, as you may have divined, they are also in the genus Amanita, which happens to include some of the deadliest mushrooms in the world. Therein lies the conundrum. Amanitas are not to be trifled with, especially here on the West Coast. We are home to the death cap, A. phalloides, the destroying angel, A. ocreata, as well as a rogue’s gallery of lesser nasties. A whole other group of amanitas, led by the magnificent A. muscaria, which I have eaten, may not kill you, but will mess with your insides and your brain. Flying reindeer, anyone? So why play with this genus at all? Some very good mushroomers, notably Michael Kuo, simply won’t. They subscribe to the “amanita no-eat-ah” rule. I find this silly. It’s like refusing to eat tomatoes because they are cousins of deadly nightshade. Nor do I take the eating of amanitas lightly, however. I have spent the time to learn about these mushrooms for one primary reason: They are over-the-top wonderful at the table. I will take a coccora (A. calyptroderma, remember?) over most mushrooms any day of the week. I like them better than — gasp! — morels, any of the Agaricus clan (this includes the button and portobello mushrooms you buy in the store), and quite possibly even the mighty porcini. They are that good. And A. velosa, the springtime amanita, is better still. Before you head out into your woods eagerly seeking this treasure, I need to stop you. If you are not an experienced mushroom hunter, and if you are not a generally cautious person, don’t mess with this mushroom. It can indeed be mistaken for one of the deadly amanitas by the unwary. Your liver is not worth a plate of mushrooms. Let me repeat: If you are careless, you could die. I mean it. Got it? Good. OK. Now, all warnings aside, you can safely identify a coccora if the mushroom you are looking at meets ALL of the following criteria. Let’s start with habitat. Fall coccora like oaks and madrone in California, Douglas fir in northern Washington and Canada. Spring coccora prefer conifers; I’ve found them beneath cedar, fir and pine. For the rest of the country, keep in mind that this is primarily a Western mushroom, although there is a member of this family in the East, I have no experience with it. Coccora are mycorrhizal, which means they live in a symbiotic relationship with the trees they hang out with. That also means they’ll show up in the same spot every year. There are two variants of coccora: Fall and spring, which is now officially A. vernicoccora. Fall coccora are easier to identify, as their caps are a warm, inviting orangey-tan. Both variants like to be around boletes, just like their cousin A. muscaria. And the fall variety really digs madrone trees. The spring version, which is what I am finding right now, prefers oaks in the Valley and conifers in the Sierra. It has a canary yellow cap. Keep in mind that color is never a good thing on which to hang your hat — or your liver and kidneys. One of the primary cautions about this mushroom, especially the spring version, is that its pale yellow cap can be confused with the greenish-yellow cap of the death cap. 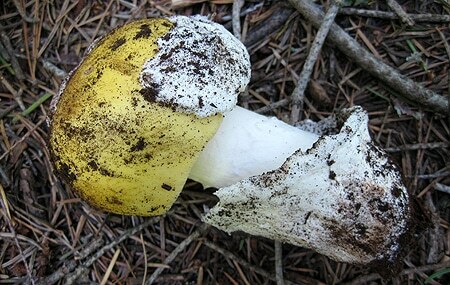 Both can be present at the same time, although I’ve found that the destroying angel, which is pure white, is a more common neighbor. Any all-white amanita should be avoided. Look at the stalk of the mushroom above. Notice something? A floppy ring, or annulus. Young coccora have a sort of skirt around the stalk, but in weather or age this gossamer tissue can slough off. Lethal amanitas tend to have a more distinct annulus (note this picture of the death cap). The stalk should be a creamy white, not pale, bluish-white. But again, a death cap can have a creamy stalk, too. See how hard this can get? Another thing to look for is the size of A. vernicoccora. It’s big. I picked one mushroom this week that weighed almost a full pound and was nearly 10 inches across at the cap. This size is another notch in the mushroomer’s favor: Lethal amanitas are not usually this large. Note that I say “not usually.” NEVER rely on one or even two indicators before eating any mushroom, and especially an amanita. Now look at the cap. See the “skullcap” covering the yellow? That is another indicator of a coccora. In general, the “good” amanitas have this solid skullcap on top; it is the remains of the universal veil that covers the baby amanita. When the mushroom grows, it pushes up through this veil and the remains stick on the cap. 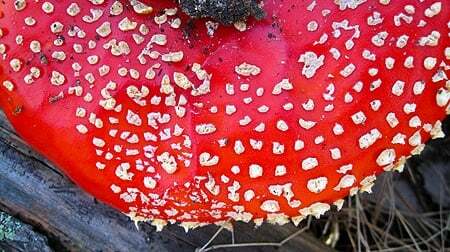 In many amanitas this veil breaks into the characteristic “warts” so famous on Amanita muscaria — these are the white polka dots on muscaria’s red cap. OK, now I’m going to mess with you again. Sometimes, the deadly amanitas also have this skullcap, and, conversely, I’ve found edible amanitas with the warts. In fact I found an A. velosa last week with warts. But the presence of a skullcap is a good sign. Another indicator is whether you can easily peel off the skullcap: You should be able to with a coccora. Keep looking at the cap. Now look at its edges. Are they striated, like this? Here’s where we start getting into the nitty gritty of identification. All coccora, A. velosa and A. vaginata (grissettes, which I will get into in another post) have this striated cap margin. It is a very important identifier. Look for it especially on young specimens. 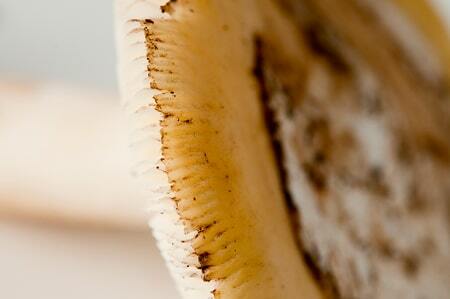 If you only see it on old ones, beware: Poisonous amanitas can develop what look like these striations as they age. It’s because the cap is collapsing over the gills. See how the gills and striations match up? The mushroom above is a fresh coccora and these striations are the real deal. 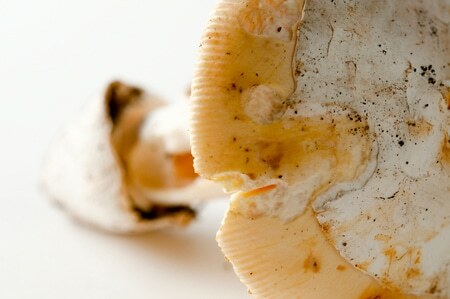 The last indicator to see whether your amanita is edible or not comes when you slice the stem. 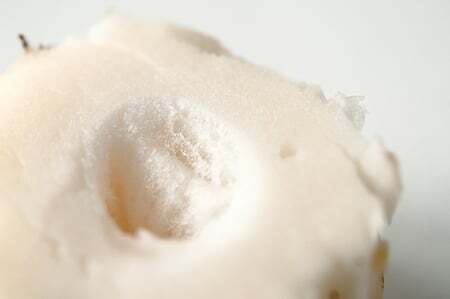 Coccora, A. velosa and grissettes all have hollow stems that often are partially filled with a cottony, webby material or a jelly-like substance. But here’s another warning: Some death caps or destroying angels also have this feature. It has a substantial, thick and v-shaped “cup” at its base. All amanitas have cups, but the shape of the cup is an important “tell” as to which species it is. The cap is buffy orange-tan, salmon-colored (fall), or canary or lemon yellow (spring), and definitely NOT white or greenish. The center of the cap has a skullcap, not warts. This skullcap should be easy to peel off. The edge of the cap has distinct striations, even on very young specimens. The stalk does not have a thick annulus or ring around it, although a coccora often will have a wispy, skirt-like ring on the stalk when young. Many times this gossamer annulus sticks to the underside of the gills. When you peel the v-shaped “cup” off the bottom of the stalk, the base of the stalk is not bulbous; it should be more or less the same width throughout, or with a slight taper. The stalk is hollow, and often partially filled with a cottony, weblike substance and/or a clear jelly. One more thing: Just because you’ve found some coccora, that does not mean the mushroom next to it is also a coccora. I’ve seen destroying angels grow right next to A. velosa. Identify each and every mushroom in your basket separately. This is one of the better plates of mushrooms I have eaten. All I did was sear the coccora a little in a hot pan until they released their water, then added several tablespoons of butter and some Italian sea salt. I cooked them over medium-high heat until they got a little caramelized on the edges. If you’re thinking they look like calamari rings, you’re right. 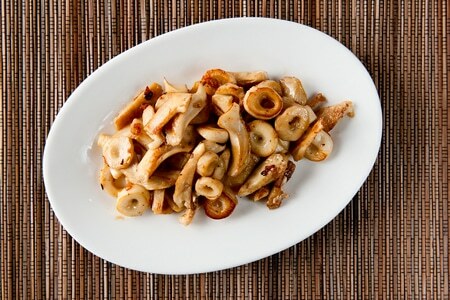 Coccora have a delicate shellfish/calamari flavor that gets horrific when the mushroom ages — an old one stinks like rotten shrimp. But young and fresh they are firm, meaty, light in the sense that chicken feels “lighter” than beef, and have an amazing presence on the plate. All foragers must make their own choices about what they will eat, what risks they are willing to take. All I can say is that if you choose to gather coccora, be cautious. Believe me, I gathered many of these mushrooms before I ate any, and even though I was absolutely certain of my identification, I still had a little flutter when I ate these. I probably always will. Perry: With all due respect, and this is not directed at you in particular, but I get pretty frustrated with mushroomers pretending that edible amanitas just don’t exist. They are in fact identifiable, and are far easier to key out than, say, a fresh candy cap. People who say I shouldn’t post about this mushroom are not helping to expand our knowledge about them. It almost smacks of censorship. On the other hand, your observation that you’ve seen A. phalloides, pantherina and ocreata with pithy stems and striated caps does help the larger debate. But I ask you this: Have you seen an ocreata or a phalloides that is canary yellow under the duff, not sun-bleached, with a pithy stem, a hat-like universal veil that comes off easily, a striated cap and that thick, v-shaped cup? Chances are you have not. Identifying this mushroom is about matching all of these characteristics, which, when taken in total, make this mushroom quite safe. Danger lies in carelessness.